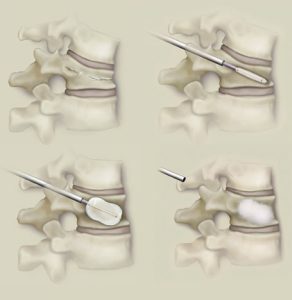 Kyphoplasty is a minimally invasive procedure to treat painful vertebral body fractures of the spine that are recent and not responsive to conservative therapy. Most fractures are due to osteoporosis with other cases often related to trauma. Osteoporosis a disease decreased bone density often seen in the elderly population. These soft bones become more susceptible to fracture. 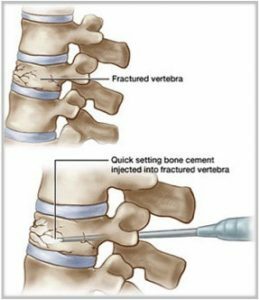 Osteoporosis affects over 200 million people worldwide with approximately 700,000 vertebral compression fractures annually in the United States. Compression fractures can be treated conservatively with bed rest, pain medications, and back bracing. Conservative management does not always provide adequate pain relief and severely limits mobility and quality of life. Also, some patients cannot tolerate taking significant quantities of pain medications. Kyphoplasty is great option for many patients. The diagnosis is made with history and symptoms. 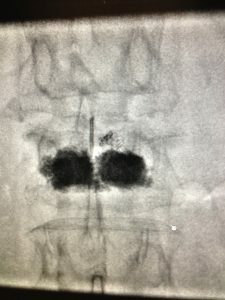 There is often point tenderness over the spine at the level of the compression fracture on exam. MRI is often needed to better characterize the fracture and appropriately select patients for Kyphoplasty. Kyphoplasty is an outpatient procedure usually performed with local anesthesia and conscious sedation. 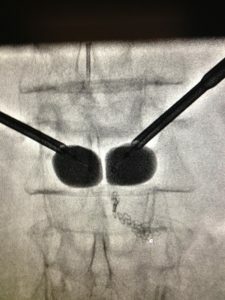 One or two small needles are carefully advanced into the compression fracture from the back. Subsequently, medical grade cement that can be visualized under x-ray is slowly injected into the broken bone until adequate filling is obtained to stabilize the fracture. After the procedure, band-aids are placed at the needle entry sites. The patient recovers for a couple hours in the department before going home. Significant pain relief is achieved in a majority of patients who are appropriately selected with recent fractures.